While the existence of Coney Dog in LA has staved off my insatiable desire to eat at Coney Islands every time I’m in Michigan, I still take advantage of Coney if it’s not too far out of the way. 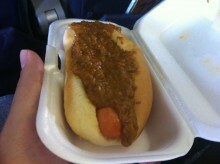 Case in point: National Coney Island at the Detroit Metropolitan Airport. 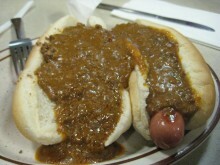 When I was there last, I was hungry and rather than blowing money on a generic sandwich, I opted for some Coney. At home on the Sunset Strip. We Detroiters (or metro-Detroiters in my case) are adamantly defensive and passionate about our Detroit roots. Ask one of the thousands of Detroit expats what they miss most about their homeland and they will give you answers ranging from the lakes to the sports to awesome summers. But there is one thing just about all of us can agree upon: we miss coney. In LA, we are about as far from Detroit as possible in the lower 48 and absence truly makes the heart grow fonder. Just about every conversation I’ve had with a former Detroiter in the 3-plus years I’ve lived in LA has led to a “wouldn’t it be awesome if we opened a coney restaurant out here?” moment. Yet, while all these conversations were taking place, a few people were making it happen. 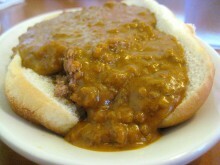 The phenomenon of the Coney Island is one of the greatest aspects of eating out in the Detroit area in Michigan. 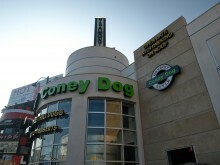 Completely unrelated to the actual Coney Island in New York, these restaurants are a result of the mixing of Greek and American foods, with the addition of the famous Coney Dog. Everyone has their favorite Coney Island, and sometimes the favorite one is just around the corner. I grew up with Farmington Coney Island half a mile away and would go at least once a week.